THE AVERAGE IRISH adult will spend almost €600 in the run up to Christmas according to a new survey. The annual spending survey, commissioned by the Irish League of Credit Unions (ILCU), shows that an average Irish shopper expects to spend €563 this Christmas. This figure is actually lower than at the same time last year, when €600 was the expected figure. Without doubt Christmas is an expensive business. “We all need to remember that Christmas really is about giving, not robbing the family finances,” says Ed Farrell of the ILCU. Setting a Christmas spending budget is more important now than ever, as is writing a list. For example, starting early to avoiding getting caught up in panic buying can really help keep costs low and provide the family member sufficient time to search for the best deal. More mature adults, aged over-35, will spend a deal more than their younger counterparts at Christmas time as you might expect. 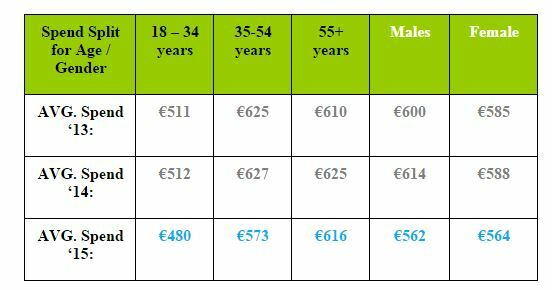 Over-55s will spend €616, compared with the 18-35 group who will pay out €480. Most (30%) people will spend between €300 and €500. It seems that the Irish are quite down on Christmas from a financial point of view. 70% of us feel worse about our financial situation than in last year’s survey. Mind you, this seems to be an annual statistic. A large percentage of us have felt badly about our situation as compared to the previous year in each of the last four years, topping out with 81% of those surveyed feeling dismayed by their financial woes in 2012. Despite this, Irish people are very fond of Christmas in general. 68% of those surveyed said there is nothing nicer than a proper Irish Christmas, while spending time with family appears to be the most important element to the festive season in Ireland. Two thirds of those surveyed prefer giving presents to receiving them. Tesco is the retailer of choice for people doing their Christmas food shopping. 31% of all such shopping is likely to take place there. Aldi and Dunnes are next in line with 19% and 16% respectively. 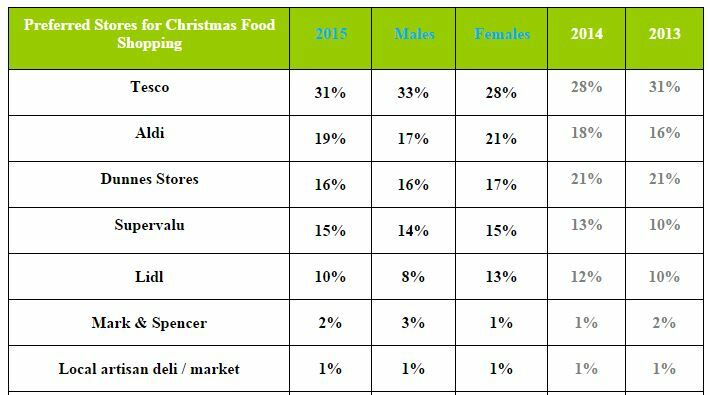 Surprisingly Supervalu finishes a distant fourth with 15%, unusual given the Irish store’s preeminence in the supermarket ratings at present. 19% of Irish shoppers will travel outside the country for their Christmas shopping, the majority of which will travel to the UK (39%), with mainland Europe the next favoured destination of choice (36%). Most Irish (88%) would never approach a moneylender at Christmas time, and would never consider doing so. 5% have done so before and would do so again. Women are slightly more likely to consult a moneylender than men. The average recovery time for the Christmas spend is eight and a half weeks. This figure remains unchanged from last year, but is a slight improvement on the nine weeks expected for recovery in 2013. 44% of those surveyed will have sufficient money in their monthly income to pay for Christmas. 23% are likely to dip into their savings, while almost half of those surveyed (45%) will have to borrow money to cope. While this sounds like a large figure, it’s actually an improvement on the 51% who said the same last year. €388 is the average amount borrowed. 65% of those polled said they will enjoy Christmas irrespective of their financial worries. 25% of those with children will spend between €50 and €100 on each child. The average per child in this case is €167. The same number of people (67%) as last year plan to shop online for presents. The main reason for this is the perceived value to be found online, while 26% of people simply find keyboard purchasing more convenient than braving the shops. Email “The average Irish person will spend almost €600 this Christmas”. Feedback on “The average Irish person will spend almost €600 this Christmas”.